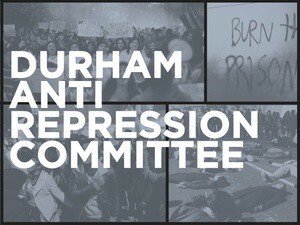 This week we feature a conversation with Steve, a member of the Inside Outside Alliance, a group in Durham working to amplify the voices of prisoners, foster better connections with their family and loved ones on the outside and raise awareness (in the words of the prisoners and their families) of problems in the Durham County Jail with an eye towards holding the Sheriff’s Dept & local government accountable. More on this project at http://amplifyvoices.com. This week we speak about the un-reported deaths in jail of Matthew McCain (January 2016), Dennis McMurray (January 2015) and briefly about the death of Raphael Marquis Bennett (August 2015). There is also a conversation on medical neglect (in Matthew’s case, he claimed he was not getting proper treatment for his diabetes and epilepsy). 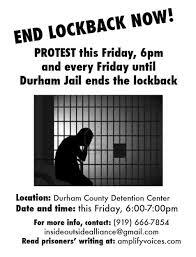 Also mentioned is the work going on around different parts of North Carolina to get communities aroused against the recent snatching up with intent to deport latino youth by Immigration and Customs Enforcement (ICE) during it’s recent spate of raids against folks accused of entering the U.S. from Central America in the past few years. 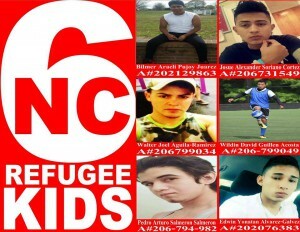 These include: A student on his way to school in Durham, named Wildin David Guillén Acosta; Edwin Alvarez-Gálvez of Raleigh & Santos Padilla-Guzman of Cary are 3 of the so-called NC 6. Here’s an article students in Durham avoiding school for fear of ICE and words from teachers and admins at the schools expressing how dangerous they feel it is for the community. One organization on facebook working to keep folks informed on the raids can be found here. On January 29th, No New Animal Lab, with representation from the Civil Liberties Defense Center, filed an anti-SLAPP Special Motion to Strike against injunctions filed on behalf of two executives of Skanska USA. Skanska and its key decision makers have been the subject of a year-long protest campaign, organized under the banner of No New Animal Lab, for their $90 million contract to build a large, underground animal research lab for the University of Washington (UW). Skanska executives at the corporation’s Portland office filed for injunctions against four activists and “No New Animal Lab” in an attempt to stifle the growing national protests. Such lawsuits are known as “SLAPPs” (Strategic Lawsuits Against Public Participation) and are often used by corporations against protest movements in an attempt to chill dissent and disrupt campaign organizing. Rather than outright criminalizing protest activity, corporations attempt to exploit the legal system, dragging grassroots activists through frivolous civil court proceedings and draining and redirecting both time and material resources. SLAPPs exist to shrewdly muzzle movements that seek to hold corporations and their executives accountable and are backdoor attempts to legislate unreasonable restrictions upon speech and assembly. One way you can help right now is to make a DONATION to the campaign. Every penny goes directly to grassroots organizing and helping with legal costs. Support means everything in moments like these. To donate to this cause, and to learn more about this campaign, you can go to the website http://nonewanimallab.com and click on the red Donate tab on their page. To hear the interview that we conducted with members of this campaign, you can visit our site. Second is track one from Gudsforladt, which is a one person project from salem, mass. the track is off their 2016 self titled release. 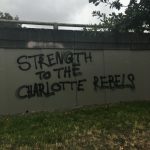 This week we continue our conversation with John, an anti-racist anarchist living in the U.S. South about thoughts and memories concerning the July 18th 2015 counter-demonstration to the KKK in Columbia, South Carolina. John also talks a bit about what he knows of the 1997 KKK march in Asheville, North Carolina and their subsequent patookis whoopin by the general population of Asheville. For farther flung listeners, if you’d like to hear this show on a station in your area, you can simply email us for requests at thefinalstrawradio@riseup.net and we can get a conversation started about making it happen. On a separate note, for years the Iron Rail Book Collective has been one of the most socially transformative projects in New Orleans and has been part of a vibrant and growing anarchist culture in the city. Some of you may be familiar with it from the NASSN conference in New Orleans or the New Orleans Anarchist Bookfair. When the police closed the Iron Rail down through selective enforcement of code violations and forced it out of its long-time site several years ago this seriously set back liberatory politics in the city. There is a fundraising campaign going on to get a house in the Upper 9th Ward as a new home for the Iron Rail. A mere $4000 will secure the site and help start renovations. 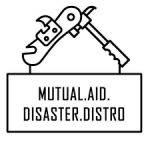 We would appreciate any help possible to get this important anarchist project reestablished. Please go to http://crowdrise.com/ironrail for information on the Iron Rail and the fundraising campaign. Also, the political prisoner birthday calendar for august 2015 is out! If you or someone you know would like to write political prisoners on their birthdays, you can view and download the pdf of this document at prisonbooks.info. These lovely rabble rousers would also like to announce that their comprehensive zine entitled How To Start a Prison Books Collective has been updated and is available for download and distro at that same address, http://prisonbooks.info. If you’d like to learn more about the situation in Syria and the continuing repression by ISIS, you can give a listen to #’s 36 and 39 of the Ex Worker podcasts put out by CrimethInc. These give specific information on and interviews with participants of the Rojava Revolution. You can listen to all their podcasts at http://crimethinc.com/podcast and some more updates on the situation of PYD/PKK/International Brigade fighters can be found about repression in Turkey and Iraq. “I signed my transfer notice yesterday. I wrote everybody and gave them the Trumbull address. I got packed up today. Then the warden notified me that Central Office Anonymous Coward cancelled my transfer. Now I missed commissary and commissary won’t let me shop. I don’t even have soap. We already sorted out the commissary issue, what we need now, is to get at the root of this, and so many other problems with SOCF. That means we need a concerted effort to address that Central Office Anonymous Coward: Trainwreck Trevor Clark. Wanna help ruin Trevor Clark’s career? We hope so. Here’s the deal: ODRC Counsel Trevor Matthew Clark is a sociopath who runs the ODRC torture program with his FBI buddies on speed dial, and he recently used his sock-puppet co-workers to harass Ben Turk and Ihsan purging them from Sean’s visiting list because Trevor Clark doesn’t like online postings. He also cancelled Sean’s transfer to lower security at the last minute. He wants to pull the plug on seanswain.org and turn Sean into his personal cat toy to swat around whenever feels like it. F this Ahole. It’s time for him to get disbarred, lose his job, and spend the rest of his miserable existence sleeping in his car. We can make that happen. It’s OUR world, and this creep is just mismanaging it. We gotta swamp the right hierarchs with a million phone calls and letters. The more calls the better. Is that reformist? Well, yeah. But the direct action alternative doesn’t seem to be happening, so let’s do what’s do-able.